On Wednesday we’ll work with WSDOT to briefly close the NB 99 ramp from Western Ave, for emergency vegetation cutting. Overgrowth is reported to be impacting driver visibility, in the area shown circled in yellow, above. Ramp from Western Ave to NB 99 to be closed for one hour. Thank you for your understanding as we work to improve safety! UPDATE | Landscaping Interbay, SLU, & W Seattle. Our Urban forestry team will cut back blackberries and other overgrowths along 15th Ave W, between W Armour and W Ruffner, and work to improve visibility from the off-ramp onto SB 15th. One lane from the on/off ramp from/to 15th Ave W will be closed. One lane closure on the ramps to and from Dravus on 15th Ave W. There will be no closure on 15th Ave W.
Next week we’ll be cutting back weeds and overgrowth in medians along Harbor Ave SW.
Plus this weekend, we’ll clean up weeds along Mercer, between Fairview and Westlake avenues N.
(Mercer St) Both the EB and WB inside lanes will be closed during work hours. (Harbor Ave SW) Both the NB and SB lanes will shift to the parking lanes, between SW Spokane St and SW Harbor Lane. 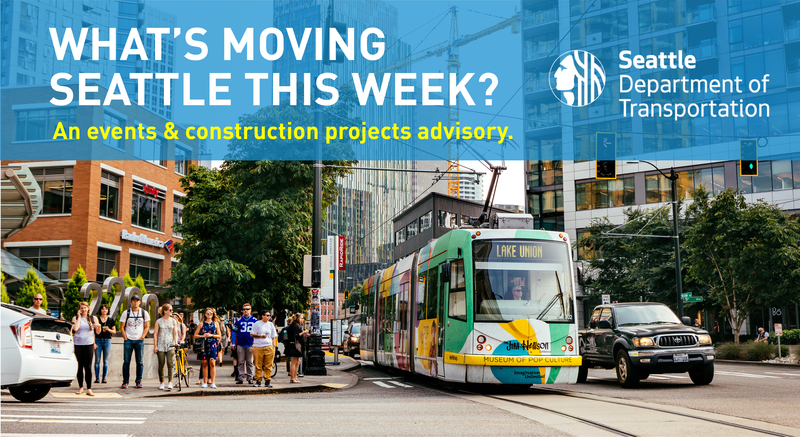 As part of our Arterial Major Maintenance (AMM) program; which is funded by the Move Seattle Levy, we’ll be resurfacing (weather permitting) NE 42nd St – from the west leg of Latona Ave NE to 4th Ave NE – and the east leg of Latona Ave NE – from NE 42nd St to approximately 4313 Latona Ave NE. Closure | Latona Ave Ne will be closed during work hours, between NE 42nd St and 4313 Latona Ave NE. NE 42nd St will be down to one lane from Latona to 4th, with a flagger directing alternating EB/WB traffic. NE 43rd St between Thackeray Pl NE and 4th Ave NE will be closed to through-traffic. Local traffic and access will be allowed, with wait times up to 15 minutes for equipment to clear. Detours |Metro buses that typically turn north onto Latona Ave NE from NE 40th St, N to NE 45th St, will be detoured to 7th Ave NE, to then head north to NE 45th St. Other vehicles will be allowed to travel on NE 42nd St.
General | Parking restrictions will be in effect during the work. Driveway access along 42nd Ave NE will be restricted. Thank you for your patience as we repave! Questions? Contact David Allen at david.allen@seattle.gov or 206.733.9302.